I received the new j.crew catalog last night and fell in love with the cover. I've danced since I was young, but never stuck with ballet. I found myself loving jazz and hip hop more, but a piece of me still wishes I would have had more of an interest at a young age. Anyway, I always find myself drawn to ballerina shoots in magazines, etc. This being one of them. 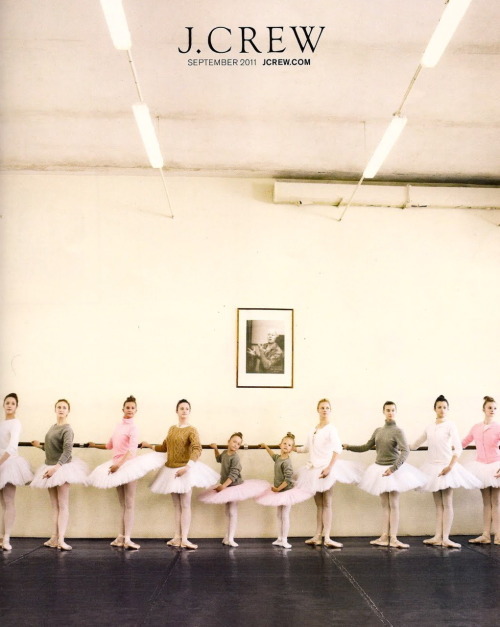 All dancers from this shoot are from the Yakobson dance studio in Saint Petersburg, Russia, featuring local ballerinas. such a pretty mix of beautiful fall cashmere sweaters and gorgeous tutus. Oh my gosh! Absolutely love! The kid in me still wants to be a Ballerina! amazing shots! :) I love jcrew! Love it! I too was swooning over my copy last night too! Gotta love JCREW! I too danced forever and now my 3 year old has started ballet! So much fun. I thought it was gorgeous too! Loved this shoot. I had been thinking about shooting my daughter/model in her point shoes. this post makes me swoon and i don't EVER use that word. seriously. just pinned it too. :) i danced from the age of 5 through highschool and i miss it every day! Lovely photos. When I visit the Met in NY, I always spend time with Degas and his lovely ballerinas.